Dr. John Coleman, Dr. John Coleman, the author of 15 books, the best known of which is Conspirators Hierarchy, The Committee of 300, was one of the the first writers to bring the world's attention to the existence of Tavistock, hitherto unknown to press and pundits alike, in a monograph published in 1969. 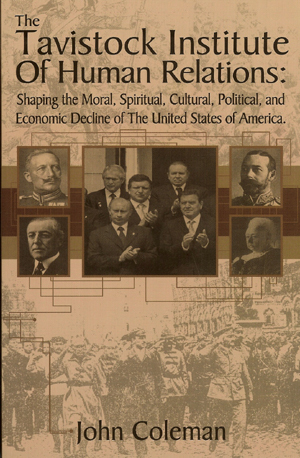 Since his initial 1969 revelations concerning the pivotal role that Tavistock plays in shaping political, social, educational, and economic 'opinions', especially in the United States, more than a few writers of global conspiracy have attempted to place laurels upon their shoulders for revelations about Tavistock's key influence as the Mother of all Propaganda Ministries, while ignoring the fact that this pioneering work was first published by John Coleman. Dr. Coleman's new book, however, leaves no doubt as to who is the master and who are the students when it comes to the subject of Tavistock. The plan to 'create' public opinion began in 1913 as a propaganda factory centered at Wellington House in London. Sir Edward Grey, the British Foreign Secretary at the time, installed Lord Northcliffe (Britain's most influential newspaper magnate) as its director. Lord Northcliffe's position was over sighted by Lord Rothmere on behalf of the British Crown. The operational staff of Wellington House consisted of Lord Northcliffe, Arnold Toynbee (future director of studies at the Royal Institute of International Affairs), and the Americans, Walter Lippmann and Edward Benays (nephew to Signund Freud). I predict that this book will earn for Dr. Coleman greater critical recognition and accolades than that achieved by The Committee of 300, which many had assumed was Dr. Coleman's masterwork. That is no longer the case. This book is Dr. John Coleman's most important work to date. After reading it, you will no longer have any doubts about WHO is manipulating you with every available communication technology known to mankind, WHY they are manipulating you, and HOW they are manipulating you into a One World fascist tyranny. 1) You can obtain Dr. Coleman's new Tavistock book for $20 (cover price $23) + shipping . For those interested in a collector's copy, Dr. Coleman has agreed to provide a limited number (500) of signed and numbered books by exclusive arrangement with educate-yourself.org. 2) 300 books have been set aside as signed and numbered copies for $30 + shipping. This is the only limited, signed edition of the Tavistock book that will be offered to the public and that offer is only available through www.educate-yourself.org Take advantage of this opportunity if you are a book collector, a book lover, or an investor with an eye towards increased value in the coming years. 3) 200 books are reserved as signed, numbered (e.g. 1/200), and personally dedicated to the purchaser for $40 + shipping. Let me know which collector's copy (or copies) you desire and who the book should be dedicated to by Dr. Coleman, for those who want the dedicated collector's copy. .
1. Tavistock: The Best Kept Secret in America . 10 The Illuminati Formula to Create an Undetectable Total Mind Control Slave . 13. The New Pearl Harbor: Was the Bush Administration Complicit in 9/11?